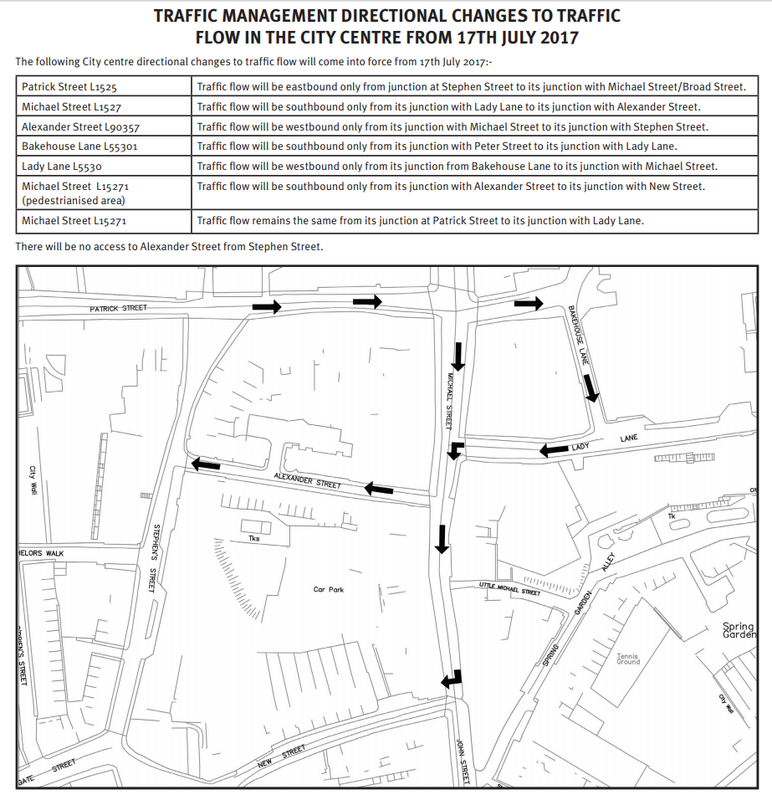 A new traffic flow layout will come into force in Waterford City centre, beginning Monday, July 17th. The changes form part of the Waterford City Centre Urban Renewal works, which were passed by resolution of Council at the Plenary Meeting on 12th November 2015. The first part of this scheme was the covering of the Applemarket. Changes to traffic layout in the city centre were part of the above, including the provision of measures to improve pedestrian, cycle and public transport access and to minimise unnecessary ‘through’ traffic. Patrick Street L1525 – Traffic flow will be eastbound only from junction at Stephen Street to its junction with Michael Street/Broad Street. Michael Street L1527 – Traffic flow will be southbound only from its junction with Lady Lane to its junction with Alexander Street. Alexander Street L90357 – Traffic flow will be westbound only from its junction with Michael Street to its junction with Stephen Street. Bakehouse Lane L55301 – Traffic flow will be southbound only from its junction with Peter Street to its junction with Lady Lane. Lady Lane L5530 – Traffic flow will be westbound only from its junction from Bakehouse Lane to its junction with Michael Street. Traffic flow will be southbound only from its junction with Alexander Street to its junction with New Street. Michael Street L15271 – Traffic flow remains the same from its junction at Patrick Street to its junction with Lady Lane. There will be no access to Alexander Street from Stephen Street. Chief Executive Michael Walsh’s report on the urban renewal scheme can be found here. Map showing details of streets and new traffic flow. Who ever designed the current traffic layout should resign it is unrealistic and will cause accident on barrack st and a joining streets and considering how much revenue the council get from.car drivers.